This season pass is valid for one additional child, basic coach class only. 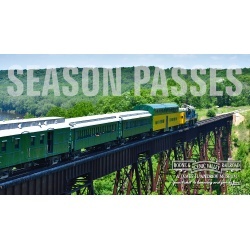 The pass is for use only on regularly-scheduled Fraser Excursion Trains. Includes admission to the James H. Andrew Railroad Museum. This season pass is valid for up to two adults, and up to two children, basic coach class only. The pass is for use only on regularly-scheduled Fraser Excursion Trains. Includes admission to the James H. Andrew Railroad Museum. This season pass is valid for one adult, basic coach class only. The pass is for use only on regularly-scheduled Fraser Excursion Trains. Includes admission to the James H. Andrew Railroad Museum.